The report gives special attention to what has been going on here in Kentucky. [I extracted all mentions of Louisville or Kentucky from the 61-page report into a separate document available here.] The percent of operating revenues contributed from the Kentucky Region was 7.5% this last quarter compared with 16.2% in 2013. This represents a drop from 2d place to 5th place among the 11 or 12 regions or operational segments. Perhaps the most newsworthy item is the first notice of which I am aware that the anticipated (hoped for?) date for a closing on the sale of CHI’s KentuckyOne Health facilities in Louisville has been put off six months to June 30, 2018. A reasonable person might conclude that KentuckyOne is having a difficult time finding a motivated buyer for its hospitals, outpatient medical centers, and physician practices here in Louisville. I am not surprised. The return of control of University of Louisville Hospital to the University has not improved the financial performance of Jewish/Sts Mary & Elizabeth Hospitals. With respect to apparently continuing discussions between CHI and Dignity Health to align their activities, the report uses the same language it did at the beginning of this year. No substantive indication is given as to how things are going. Although some media reports use the word “merger” to describe the process, that word seems to be carefully omitted in accounts by CHI itself. The good and not as good. I must confess that to my reading, CHI is in the same system-wide ballpark in which I perceived it at the end of FY2017. 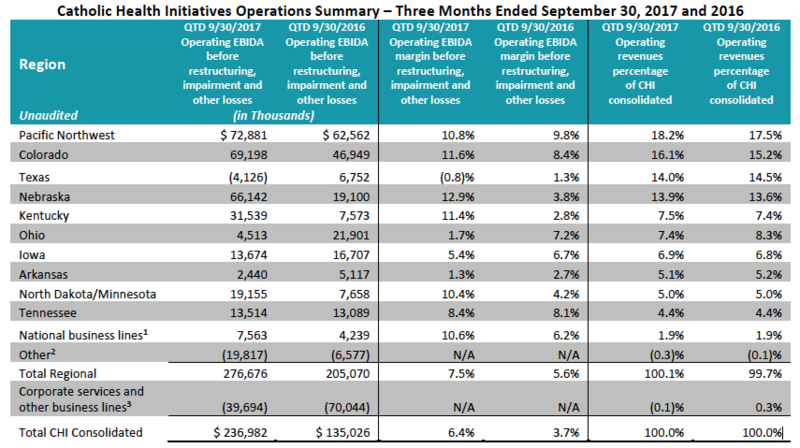 I welcome other analysis or opinion, but the EBIDA accounting numbers do not help me understand what is going on under the hood. CHI’s financial bottom line is being supported by a decrease in employees and a continuing sale of brick-and-mortar facilities. In my opinion this is like selling your seed corn. [Layoffs led to a quality- and accreditation scare at UofL Hospital last year.] Patient volumes continue to decrease. There is no follow-up on what happened to the $719 million loss in the physician operations of FY2017 other than that investments in physician activities continue to be made in anticipation of future gains. Total operating revenues increased only 1% compared to one year ago. Cash-on-hand, liquidity, and total current assets are less than in the preceding three months. Compared to June 30, 2017, total debt is unchanged at $8.6 billion. The ratio of debt to capitalization is increasing. Last season’s hurricanes and the loss of its relationship with the University of Louisville both delivered hits to CHI’s financial performance. [Louisville appears to have done more damage than nature!] I do not interpret comparisons to the same quarter of one year ago or the three months ending last June as uniformly rosy. I will leave it to financial gurus and the bond-rating companies to figure it all out. If I am misreading anything, I trust someone will help me make appropriate corrections. For those of us in Louisville, there were other items in the report of considerable practical interest to our community. The separation from the University of Louisville and its teaching hospital were costly to CHI and KentuckyOne in more ways than one. The current quarterly report details a $469 million hit against assets consisting of a $319 million loss from the return of University of Louisville Hospital and the $150 million to buy-out of the Jewish Heritage Fund for Excellence– the only other non-CHI owner of KentuckyOne Health. It has been apparent that University Hospital was a moneymaker for KentuckyOne, propping up its Louisville operations. In the current report, no CHI earnings are attributed to University Hospital. For Medicare purposes, Jewish and Sts Mary & Elizabeth are a single hospital and are reported as such in the current financial statement. The operating revenues of this combined entity from July through September 2017 were $182 million compared with $189 million for the same months in 2016. 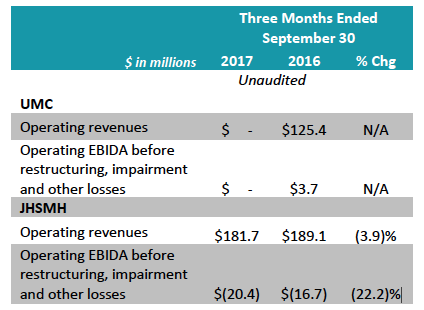 Operating earnings even before adjustments for restructuring, impairment, and other losses were in the deeper red at $(20.4 million) compared to a loss of $(16.7 million) in the first quarter of FY2017. My understanding is that after the various adjustments that these losses are even more significant. Unless my arithmetic is wrong, these constitute losses of many millions of dollars monthly. This calculus makes me wonder how attractive KentuckyOne’s Louisville facilities might be to a potential buyer. If the leadership of CHI, Jewish Hospital, and the University of Louisville could not make it work over the past decade, who can, and how? It remains to be seen to what degree, if any, University Hospital has escaped being wounded following its annulled marriage to KentuckyOne. That is not to say that there is nothing here worth owning. KentuckyOne holds the license to do solid-organ transplantations, and perhaps financial interest in other medical treatments being developed within the Medical Center. The beds of these hospitals could be valuable to other hospital systems within Jefferson County, but the most likely buyer, Norton Healthcare, would have anti-trust problems in amassing a larger market share than it already enjoys. Seems to me that a hospital system with a big emphasis on cardiac disease might be interested in these licenses and the relatively new Jewish Hospital Rudd Heart and Lung Center tower. Indeed, doctors-lounge rumors tell me that at least two large national hospital/insurance systems– with names everyone knows– came to kick the tires. The same rumor-mill also tells that these and other lookers left the lot without buying. I have no confirmation that any of rumors suggested to me were verifiably true, but I make mention them here to illustrate the degree of anxiety felt by at least some of the current Louisville employees of KentuckyOne who have no idea what is coming or if they will have a job. Even folks in other Louisville health facilities are nervous about what is going to happen to all the patients cared for in Louisville by KentuckyOne, many if not most of whom are Medicaid or Medicare beneficiaries. It remains my opinion that the institutions most at risk from what is happening to KentuckyOne in these many dimensions is the University of Louisville and its Medical Center. In my opinion– or at least in my fears– a medical earthquake is going to strike Louisville with a disruptive magnitude approaching that of the New Madrid earthquake of 1811 which changed the course of the Mississippi River. That river even ran backwards for a while. Hopefully, Louisville’s medical scene will soon return to a navigable channel, even if not between its former banks. I wish the people at the helm the best of luck for all of our parts. In October, 2016, Catholic Health Initiatives And Dignity Health signed a non-binding letter of intent to explore aligning their organizations in order to their ministry of service. It was anticipated that discussions would continue through early 2017. We are now well past that point in December, 2017. The word “merger” was not used in the earlier announcement, although numerous media reports have used that word. Other reports have referred only to more limited interactions. Recent financial reports from the two companies speak in general terms only of ongoing efforts at due diligence. In this regard, in a recent interview published in Modern Healthcare, Lloyd H. Dean, President and CEO of Dignity Health, referred to a future of multiple relationships and partnerships including with Kindred, the University of California San Francisco, Intermountain Healthcare, Kaiser Permanente, and even Google. The interview was silent about any future interactions with Catholic Health Initiatives. I have no more recent public information about the futures of Catholic Health Initiatives, KentuckyOne Health, or Dignity Health. That expected endpoints for sale of assets or alignments, are being progressively extended gives me reason to doubt that any full merger is on the horizon. In the original version of this article, I implied that KentuckyOne Health had an ownership interest in Louisville’s Cardiovascular Innovation Institute. In 2003 when the Institute was created, that was the case. It has been pointed out to me that in 2012, the partnership changed to the University of Louisville and the Jewish Heritage Fund for Excellence. I confess that the relationships of the Fund with Jewish Hospital, Jewish Hospital and St. Mary’s HealthCare, KentuckyOne Health, and Catholic Health Initiatives as they evolved over the last decade remains confusing to me. I note that the Institute’s logo as it currently appears on its website mentions only the University of Louisville and Jewish Hospital. Until the matter can be clarified for me, I withdrew my speculation that patents, licenses, or assets of the Institute might be attractive to potential buyers of KentuckyOne’s Louisville assets. Can someone clarify for me privately or otherwise? It was suggested to me by a reader that a group of investors were in the running to purchase the assets of Catholic Health Initiatives/KentuckyOne Health in Louisville. My assumption has been that a purchaser of the catalog of Louisville assets en bloc would be another hospital system. I had already known that KentuckyOne had sold (at least) the management rights of one of its downtown medical office buildings. A little detective work yesterday revealed that Catholic Health Initiatives has already sold virtually all of its bricks-and-mortar assets in Louisville beginning in 2015 and ending in the spring of 2016. Except for the two main acute care hospital buildings themselves, what is there left to sell? (Of course, there is more to business assets than land and buildings.) I will write up my findings in the next day or two, but the implications for seller, buyer, the University, and current tenants of the medical office buildings that have been sold seem to me to be both complex and worrisome. Previous Previous post: University of Louisville Hospital Pledges To Do Better. Next Next post: The Search For A New President of UofL Must Be More Open.